Be sure to experience the Niaulani Rain Forest during your visit to VAC’s educational campus inside of Volcano Village, just outside of Hawai`i Volcanoes National Park. This rare, award-winning, easily-accessible natural and cultural resource contains impressive displays of natural, ancient artwork and is a successful example of rain forest restoration. Every Monday morning from 9:30 a.m. to 10:30 a.m, learn about rare native Hawaiian rain forests, and specifically Niaulani rain forest, in VAC’s guided rain forest tour. Visitors learn about Niaulani’s overall ecological importance as one of the last old-growth koa and’ōhi’a rain forests, VAC’s role in its protection and restoration, the continual threats to its integrity, how Hawaiian plant and animal species have closely evolved with one another, how native species have evolved to be different from their colonizing ancestors, and ethnobotanical uses of Hawaiian flora. For more information, click here. 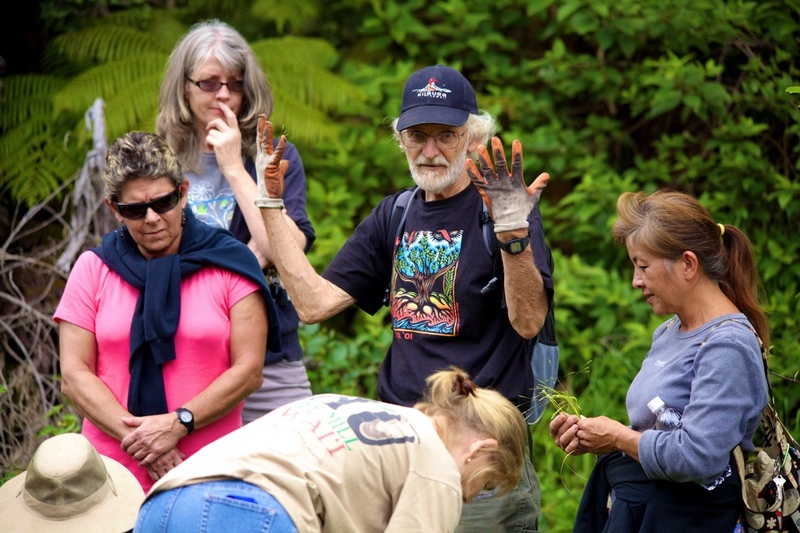 Learn about Niaulani and concepts within themes such as general Hawaiian rain forest ecology, ethnobotany, sustainable use, island watersheds, plant identification and more during tours any day of the week and in accordance to individual or groups’ needs. The suggested donation is $5/person/45 minute tour and $7/person/1 hour. Scheduled school group tours are free. Content matter is appropriate for ages 6 and older. Group sizes larger than 20 people will be split to ensure a more comfortable tour. Maximum group size is 30 people. Wear attire that is appropriate for potentially wet weather. For more information, click here. 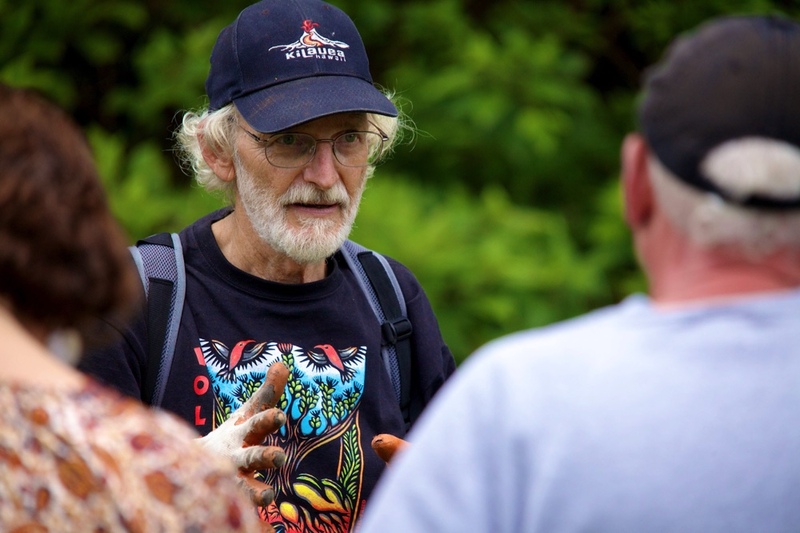 Volunteers will lead monthly forest restoration groups. These sessions last approximately 1 1/2 hours. Wear closed toe shoes, attire suited for wet weather, and bring work gloves. Please contact Tim Tunison at volcanoplantguy@gmail.com for more information. VAC inherited Niaulani upon securing a 65-year lease from the State of Hawaii in 1996. 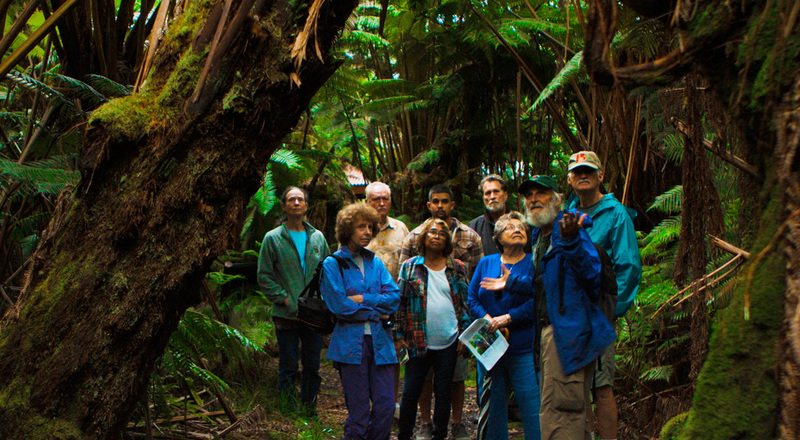 It had been designated a Forest Reserve beginning in the 1920’s due to its old growth koa and ohia canopy, and part of the contractual agreement was for our organization to continue the generational legacy of stewardship set forth by state foresters. While Niaulani supported old-growth trees that had been historically harvested for various purposes elsewhere in the Kilauea Summit region, much work had to be done eliminating invasive plant and animal species on the forest floor to bolster its overall biodiversity. VAC constituents, comprised of local artisans and naturalists, began tending to the land years before educational facilities were built on the periphery of the five acre forest. For more information on the history of the Niaulani program, click here.